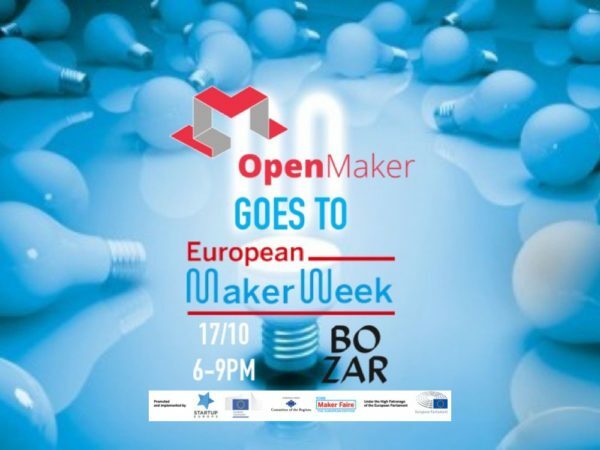 Open Maker and European Maker Week: Disrupt, create, make! 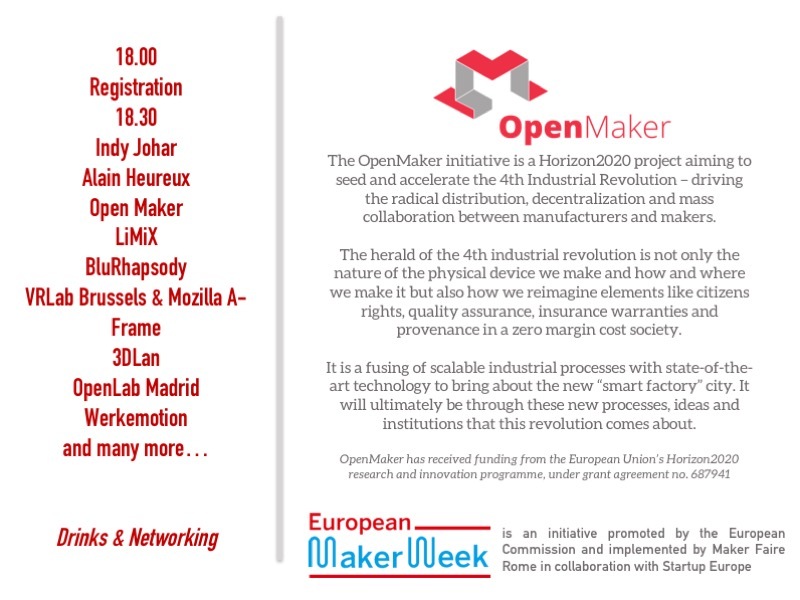 Home › News › Open Maker and European Maker Week: Disrupt, create, make! 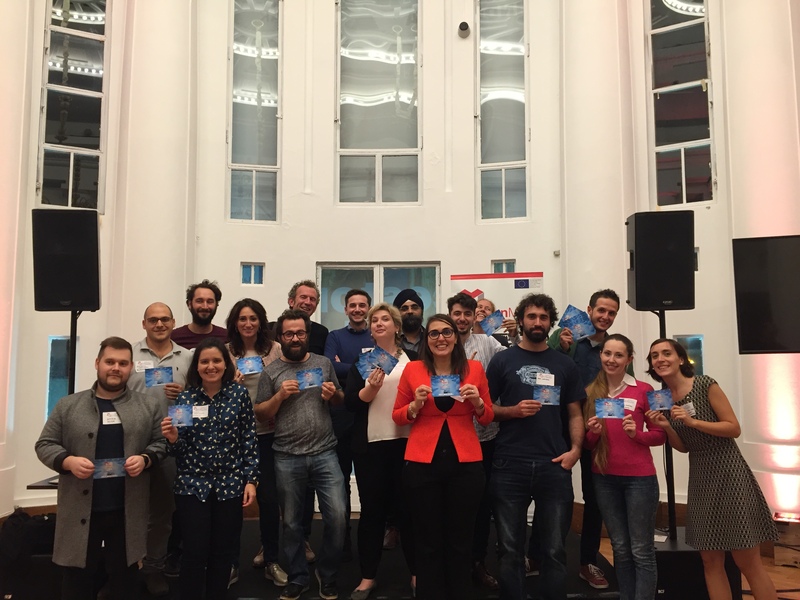 OpenMaker hosted un unparalleled journey with makers, visionaries, game changers, politicians and influencers where we discovered cutting-edge experiences from across Europe, experimented prototypes and debated how to shape the future European policies for makers and industry. The “Maker Movement” is the name given to the increasing number of people coming from different backgrounds, who are employing do-it-yourself (DIY) and do-it-with-other (DIWO) techniques and processes to develop unique technologies and products as well innovative solutions. It became an emerging and dynamic social technology-based movement, embracing ‘Open Manufacturing’, a new paradigm for production, closer to people and local communities. 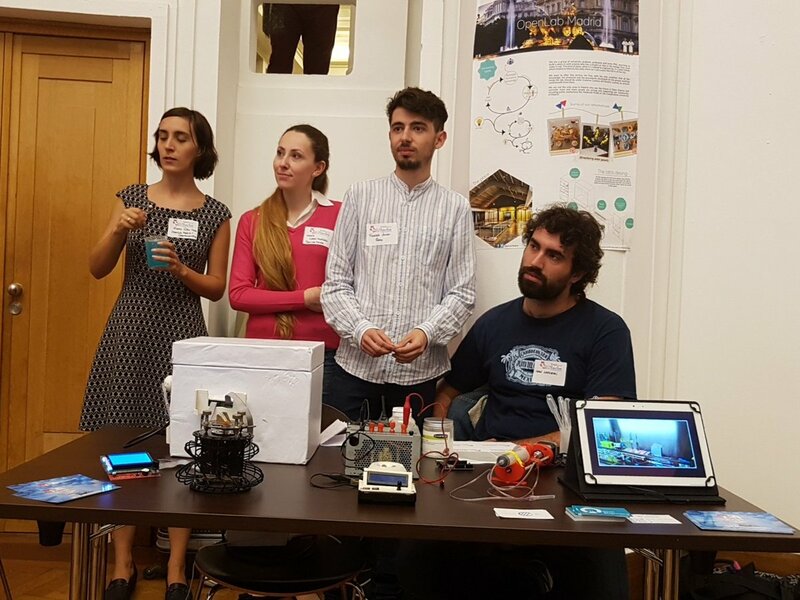 The OpenMaker event aimed in particular at showcasing, in the spirit of the project, how partnerships between makers and industry can develop cutting edge technical innovations with the potential to address societal challenges. Alain opened the evening. He’s a Serial Entrepreneur, passionate about innovation, coaching talents, inspire and train entrepreneurs or entrepreneurs. 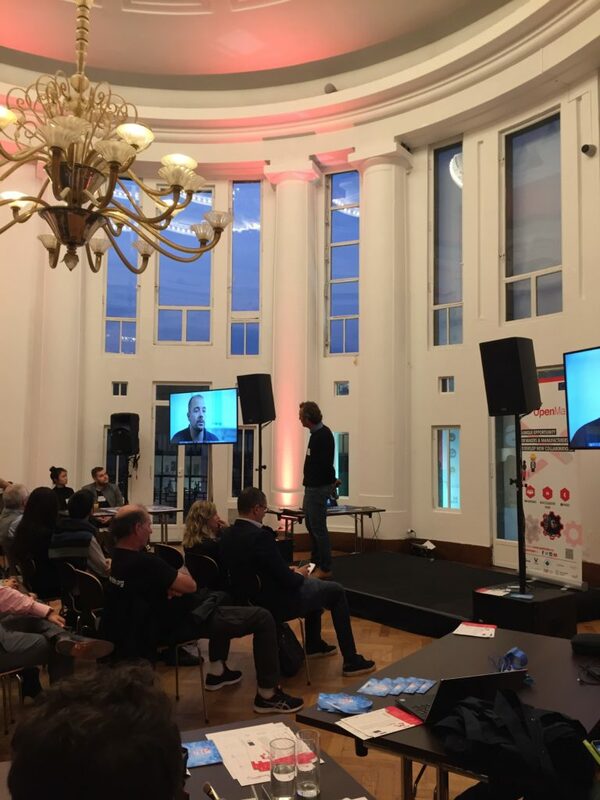 A Brussels lover, digital transformer and founder of many associative initiatives: IAB Europe, European Digital Advertising Alliance, The Egg Brussels, Brussels Creative, the Creative Ring and the European Strategy Policy Forum. Antonio presented Bluerhapsody: pasta of excellence, designed to surprise both the eye and the palate. It is a selection of top-quality durum wheat semolina carefully crafted and always kneaded in small amounts, which ensures perfect texture. Technological innovation implemented in this project has become a tool shaping imagination: it is in the hands of the artist, who draws inspiration from nature and creates shapes. With its surprisingly new appearance, pasta is ready to be a tool in the chef’s hands and to become a work of art. A spin-off project of Barilla, developed to explore food 3D printing for pasta. Currently in its startup process, is serving Michelin’s starred chefs and high-level caterings to augment the gastronomical experience making it available for customisation of ingredients and shapes. The project will also have a revolutionary impact for those with intolerances or that need to follow a specific diet. 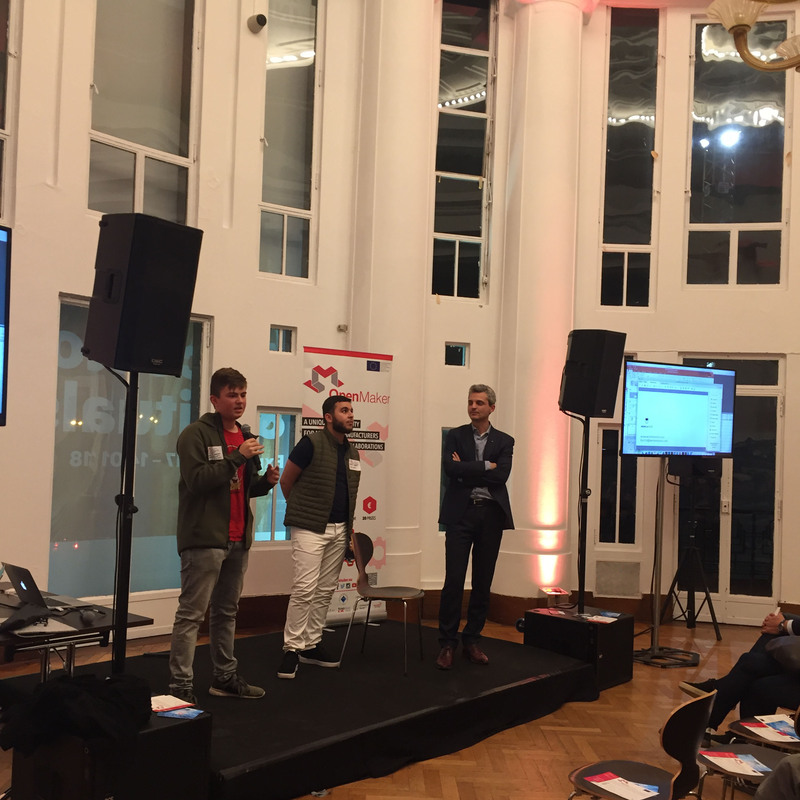 Francesco and Dario Corona, co-founders of LiMiX, presented Talking Hands the device that translates sign language into voice. Talking Hands is a new product with a strong social impact: it is a completely wearable device, similar to a glove, that translates the LIS (Italian sign language). Using it, the deaf people will tear down the wall of incommunicability and be understood by everyone. It records hand movements during sign language usage, translates them and transfers signal to a smartphone, which pronounces the sentence using a voice synthesizer. The signs can raise their voice. 3D printing offers great opportunities in the area of accessibility, since it allows designing and manufacturing solutions to meet very diverse needs. 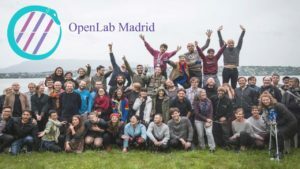 The 3DLAN project aims to take advantage of this potential by creating a collaborative ecosystem between makers, entities, companies and people with functional diversity. The association and the space are and will be totally open and freely accessible, favoring the creation of a multidisciplinary community that helps to approach the problems of the different branches of science from a joint point of view. Bystrik presented Werkemotion an independent Transportation & Industrial design studio located Bratislava. The studio was founded in 2013 by Bystrik Micek, a person with a lot of professional experience mainly in transportation, industrial and visual design. WERKEMOTION s.r.o. offers an engaging portfolio of premium design services. It includes high-end transport and industrial design, attractive styling and elaborated solutions, idea-making and product marketing with successful new selling tools. The products can be described as delicate yet powerful, innovative yet qualitative. They are objects, but still emotions, with a strong bond that arises the very moment you experience them. The team is built from powerful, young, creative and actively innovative visionaries, all blessed with mad skills and strong experienced background. Every product they create is a guaranteed satisfaction. The Gluon Foundation is a group of trendsetters from the world of culture, politics, industry and science devoted to supporting Gluon’s innovative exhibitions and programs. Belonging to the Gluon Foundation means taking part in the future and supporting collaborations between artists, researchers and entrepreneurs. Gluon is an organisation that realizes projects on the crossing borders of visual art, research and industry. 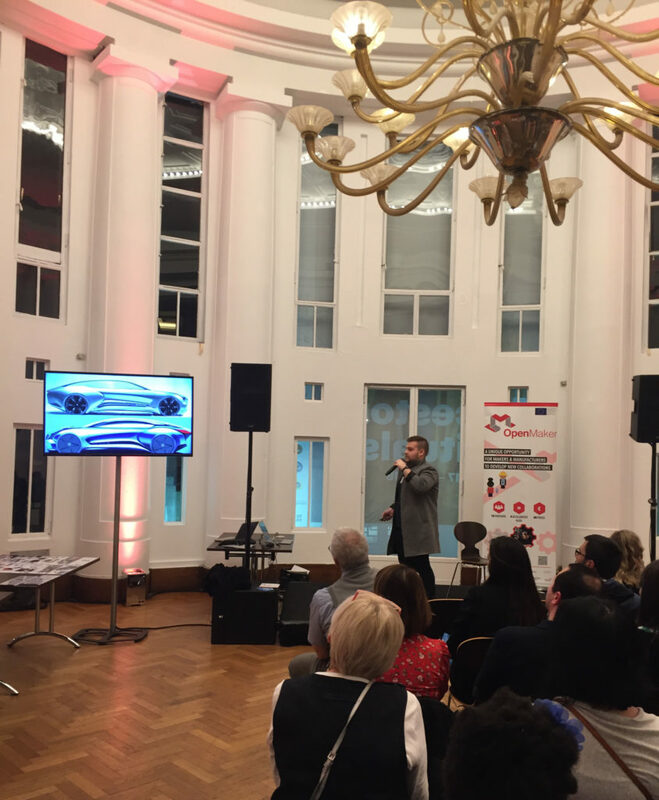 For the realisation of its programme Gluon is supported by an extensive network of national and international research institutes, museums, public authorities, businesses and artists. 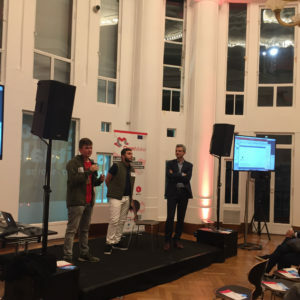 Five partners are currently involved in its operation ab initio: the Research Institute iMinds, Erasmus Hogeschool Brussel, iMAL, BOZAR and ZEBRASTRAAT. Indy is an architect, co-founder of 00 (project00.cc) and a Senior Innovation Associate with the Young Foundation and Visiting Professor at the University of Sheffield. 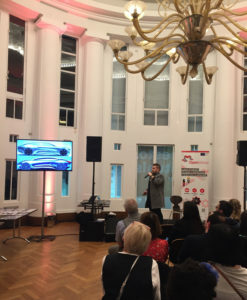 Indy, on behalf of 00, has co-founded multiple social ventures from Impact Hub Westminster to Impact Hub Birmingham and the HubLaunchpad Accelerator, along with working with large global multinationals & institutions to support their transition to a positive Systems Economy. He has also co-led research projects such as The Compendium for the Civic Economy, whilst supporting several 00 explorations/experiments including the wikihouse.cc, opendesk.cc. Indy is an Advisor to the Earth Security Initiative and a director of WikiHouse Foundation. Indy Johar is a co-founder of the Project00.cc Research Laboratory & Skunk Works.